Apparently, you are now confused in choosing between Chrome Azzaro and Chrome Legend. Both are men’s fragrances made by Loris Azzaro. Even though both of these two fragrances are coming from the same series, there are indeed some notable differences between them. Still, both are excellent scents that have received lots of compliments. So, what is the difference between Chrome Azzaro and Chrome Legend? You can find the comparisons between them below! The clean metallic notes of Chrome Azzaro result from the combination of the citrusy and greenish ingredients in the top notes. The top notes include lemon, rosemary, neroli, pineapple, and bergamot. The heart notes then deliver some fresh spicy notes of cyclamen, coriander, jasmine, and oakmoss. Finally, the base notes consist of sandalwood, tonka bean, musk, cedar, rosewood, and cardamom. Chrome Legend has fewer citrusy ingredients and incorporates tea leaves instead. The most prominent notes are green apple, tea leaves, and bitter orange, supported by the warmth of musk, tonka bean, vetiver, oakmoss, cedar, and amber. The result is such a rejuvenating green scent. Chrome Legend has a slight advantage here over Chrome Azzaro. To many people, Chrome Legend has proven that it can last somewhat longer. The scent can last above seven hours, allowing you to go through the whole day without needing to re-apply the fragrance. It also has quite heavy sillage that radiates a few feet away, great for enhancing your presence. Chrome Azzaro actually also has good sillage and longevity, but the sillage is more moderate compared to Chrome Legend. - All our fragrances are 100% originals by their original designers. We do not sell any knockoffs or imitations. Both Chrome Azzaro and Chrome Legend are great fragrances, and, in the end, the choice comes down to your personal preference. 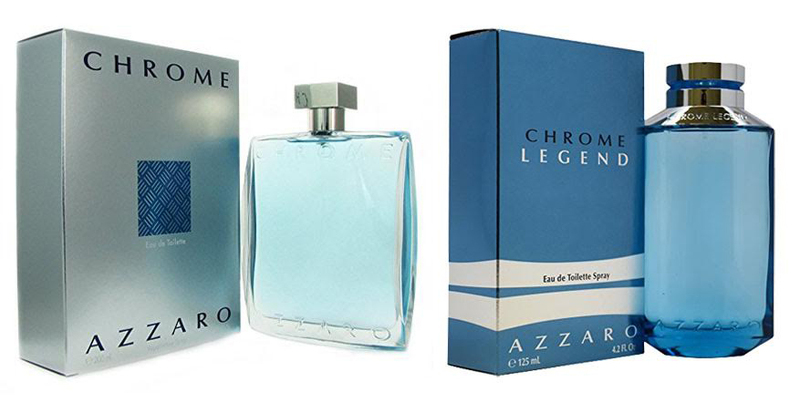 Chrome Azzaro if you like clean, metallic notes, Chrome Legend is you like green notes. If you are fine with either, we recommend you to choose Chrome Legend, which is a little bit more versatile and projects more strongly.